Little things, you may have heard, mean a lot. L.M. Montgomery wrote that it’s dreadful what little things lead people to misunderstand each other. That observation hits home this week, but I stand with Sir Arthur Conan Doyle, who pointed out that the little things are infinitely the most important, not just in solving mysteries but also in our daily lives. If big things are bumming you out, enjoy the little things. One small thing that made me happy this weekend was the return of Long-tailed Ducks to our lakeshore. Can Snowy Owls be far behind? Corey could have chosen his first Pine Siskins of the year in New York, a Red-headed Woodpecker, a late Osprey, or a Vesper Sparrow as his Best Bird of the Weekend this weekend. 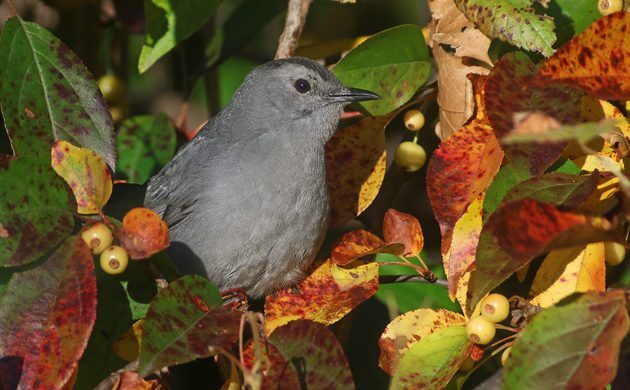 But it was a common bird sitting in good light that he tapped for the honors, a Gray Catbird that cooperated wonderfully in Kissena Park. I can finally report a mega from my weekend- Rufous-crested Coquette at Rancho Naturalista. I was very pleased that the juv. male seen there two weeks ago is still reliable. First documented record of this species in Costa Rica for more than a 100 years! It was also a happy avian trifecta for me- lifer, year bird, and country bird. Wow, Pat, that makes my simple new Lifer kinda trivial…What an incredible find, Congrats! I am still very happy to finally add the Sora to my life list. I was set up photographing Gallinules, when it just swam out on the far side of the marsh. @Tom- No lifer is trivial, congrats on the Sora! Let’s make that a lifer trifecta–I heard but didn’t see (or did I?) my lifer Eastern Screech Owl, on a full-moon owl walk from the Wissahickon Environmental Center under the guidance of the estimable BirdPhilly leader Tony Croasdale. We heard two of them calling for quite a while, which was simply amazing. But before the calling, a few of us glimpsed something small fly silently over our group … too fast and dark to ID, but wouldn’t it be awesome if that was a Screech Owl too?